mundane jane: I've got mine. But you'd better hurry. I've got mine. But you'd better hurry. 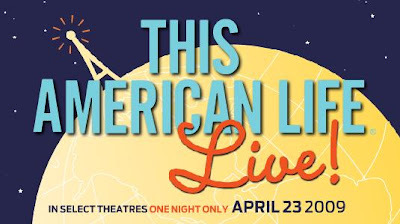 Tickets went on sale today for the next live performance of the radio show, This American Life, and it's happening on April 23. "Ira Glass will host an actual episode of the radio program, performed onstage by some of our favorite contributors. Dan Savage, Starlee Kine, and Mike Birbiglia will tell stories. David Rakoff and Dave Hill will conduct a 'special investigation.' Plus a new cartoon from Chris Ware, additional visuals by Arthur Jones, and a very special appearance by Joss Whedon, creator of Buffy the Vampire Slayer. The performance will last around two hours. Come on out!" I missed it last time, because I was under deadline. My friend Tawana was there, though, and she hasn't stopped talking about it. It still hurts my heart that I missed it. By the way, if you've never seen radio live, you should. Find a theatre and get your tickets here. Wow, no theater in Charleston, SC is participating. Not even the super cool indy theater that sells buckets of beer. Color me disappointed.